^ 1.0 1.1 参见Silvanus P. Thompson的Calculus made easy中的二进制形式的证明，St. Martin's Press, New York, 1998. ISBN 978-0-312-18548-0. ^ 这个极限可以由Rudin p. 57的Theorem 3.20e得出。对於一个更加直接的方法，请参见Finney, Weir, Giordano（2001）Thomas' Calculus: Early Transcendentals 10ed, Addison-Wesley, New York. Section 8.1, example 2 (a) , example 6(b). ^ 16.0 16.1 J J O'Connor and E F Robertson. History topic: The real numbers: Stevin to Hilbert. MacTutor History of Mathematics. 2005-10 [2006-08-30]. （原始内容存档于2007-09-29）. ^ Mathematics Magazine:Guidelines for Authors. Mathematical Association of America. [2006-08-23]. ^ 由Richman（p.396）观察到。 Hans de Vreught. sci.math FAQ: Why is 0.9999… = 1?. 1994 [2006-06-29]. ^ Cecil Adams（英语：Cecil Adams）. An infinite question: Why doesn't .999~ = 1?. The Straight Dope（英语：The Straight Dope）. Chicago Reader（英语：Chicago Reader）. 2003-07-11 [2006-09-06]. ^ Blizzard Entertainment Announces .999~（Repeating）= 1. Press Release. Blizzard Entertainment. 2004-04-01 [2006-09-03]. ^ John L. Bell. An Invitation to Smooth Infinitesimal Analysis (PDF). 2003 [2006-06-29]. ^ Berlekamp, Conway, and Guy（pp.79–80, 307–311）讨论了1和1/3，也简略地提到了1/ω。对於0.111…2的博弈可以直接从伯利坎普法则得出，在以下的网站有所讨论： A. N. Walker. Hackenstrings and the 0.999…? 1 FAQ. 1999 [2006-06-29]. （原始内容存档于2006-06-16）. ^ Kroemer, Herbert; Kittel, Charles. Thermal Physics 2e. W. H. Freeman. 1980: 462. ISBN 978-0-7167-1088-2. ^ Floating point types. MSDN C# Language Specification. [2006-08-29]. （原始内容存档于2006-08-24）. Alligood, Sauer, and Yorke. 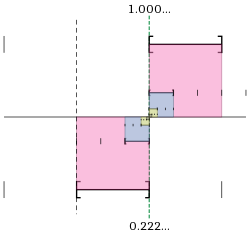 4.1 Cantor Sets. Chaos: An introduction to dynamical systems. Springer. 1996. ISBN 978-0-387-94677-1. Apostol, Tom M. Mathematical analysis 2e. Addison-Wesley. 1974. ISBN 978-0-201-00288-1. Bartle, R.G. and D.R. Sherbert. Introduction to real analysis. Wiley. 1982. ISBN 978-0-471-05944-8. Beals, Richard. Analysis. Cambridge UP. 2004. ISBN 978-0-521-60047-7. Berlekamp, E.R. ; J.H. Conway; and R.K. Guy. Winning Ways for your Mathematical Plays. Academic Press. 1982. ISBN 978-0-12-091101-1. Berz, Martin. Automatic differentiation as nonarchimedean analysis. 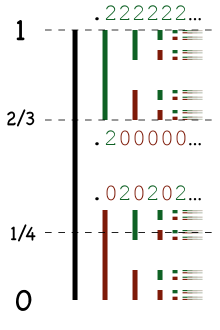 Computer Arithmetic and Enclosure Methods. Elsevier: 439–450. 1992. Bunch, Bryan H. Mathematical fallacies and paradoxes. Van Nostrand Reinhold. 1982. ISBN 978-0-442-24905-2. Burrell, Brian. Merriam-Webster's Guide to Everyday Math: A Home and Business Reference. Merriam-Webster. 1998. ISBN 978-0-87779-621-3. Conway, John B. Functions of one complex variable I 2e. Springer-Verlag. 1978 . ISBN 978-0-387-90328-6. Davies, Charles. The University Arithmetic: Embracing the Science of Numbers, and Their Numerous Applications. A.S. Barnes. 1846. DeSua, Frank C. A system isomorphic to the reals. The American Mathematical Monthly (限制访问)使用|format=需要含有|url= (帮助). 1960-11, 67 (9): 900–903. Dubinsky, Ed, Kirk Weller, Michael McDonald, and Anne Brown. Some historical issues and paradoxes regarding the concept of infinity: an APOS analysis: part 2. Educational Studies in Mathematics. 2005, 60: 253–266. doi:10.1007/s10649-005-0473-0. Edwards, Barbara and Michael Ward. Surprises from mathematics education research: Student (mis) use of mathematical definitions (PDF). The American Mathematical Monthly. 2004-05, 111 (5): 411–425. Enderton, Herbert B. Elements of set theory. Elsevier. 1977. ISBN 978-0-12-238440-0. Fjelstad, Paul. The repeating integer paradox. The College Mathematics Journal (限制访问)使用|format=需要含有|url= (帮助). 1995-01, 26 (1): 11–15. doi:10.2307/2687285. Gardiner, Anthony. Understanding Infinity: The Mathematics of Infinite Processes. Dover. 2003 . ISBN 978-0-486-42538-2. Gowers, Timothy. Mathematics: A Very Short Introduction. Oxford UP. 2002. ISBN 978-0-19-285361-5. Grattan-Guinness, Ivor. The development of the foundations of mathematical analysis from Euler to Riemann. MIT Press. 1970. ISBN 978-0-262-07034-8. Kempner, A.J. Anormal Systems of Numeration. The American Mathematical Monthly (限制访问)使用|format=需要含有|url= (帮助). 1936-12, 43 (10): 610–617. Komornik, Vilmos; and Paola Loreti. Unique Developments in Non-Integer Bases. The American Mathematical Monthly (限制访问)使用|format=需要含有|url= (帮助). 1998, 105 (7): 636–639. Leavitt, W.G. A Theorem on Repeating Decimals. The American Mathematical Monthly (限制访问)使用|format=需要含有|url= (帮助). 1967, 74 (6): 669–673. Leavitt, W.G. Repeating Decimals. The College Mathematics Journal (限制访问)使用|format=需要含有|url= (帮助). 1984-09, 15 (4): 299–308. Lewittes, Joseph. Midy's Theorem for Periodic Decimals. New York Number Theory Workshop on Combinatorial and Additive Number Theory. arXiv. 2006. Lightstone, A.H. Infinitesimals. The American Mathematical Monthly (限制访问)使用|format=需要含有|url= (帮助). 1972-03, 79 (3): 242–251. Mankiewicz, Richard. The story of mathematics. Cassell. 2000. ISBN 978-0-304-35473-3. Maor, Eli. To infinity and beyond: a cultural history of the infinite. Birkhäuser. 1987. ISBN 978-3-7643-3325-6. Mazur, Joseph. Euclid in the Rainforest: Discovering Universal Truths in Logic and Math. Pearson: Pi Press. 2005. ISBN 978-0-13-147994-4. Munkres, James R. Topology 2e. Prentice-Hall. 2000 . ISBN 978-0-13-181629-9. Pedrick, George. A First Course in Analysis. Springer. 1994. ISBN 978-0-387-94108-0. Petkovšek, Marko. Ambiguous Numbers are Dense. American Mathematical Monthly (限制访问)使用|format=需要含有|url= (帮助). 1990-05, 97 (5): 408–411. Pinto, Márcia and David Tall. Following students' development in a traditional university analysis course (PDF). PME25: v4: 57–64. 2001. Protter, M.H. and C.B. Morrey. A first course in real analysis 2e. Springer. 1991. ISBN 978-0-387-97437-8. Pugh, Charles Chapman. Real mathematical analysis. Springer-Verlag. 2001. ISBN 978-0-387-95297-0. Richman, Fred. Is 0.999… = 1?. Mathematics Magazine (限制访问)使用|format=需要含有|url= (帮助). 1999-12, 72 (5): 396–400. Free HTML preprint: Richman, Fred. Is 0.999… = 1?. 1999-06-08 [2006-08-23]. （原始内容存档于2006-09-02）. Rosenlicht, Maxwell. Introduction to Analysis. Dover. 1985. ISBN 978-0-486-65038-8. Rudin, Walter. Principles of mathematical analysis 3e. McGraw-Hill. 1976 . ISBN 978-0-07-054235-8. Shrader-Frechette, Maurice. Complementary Rational Numbers. Mathematics Magazine (限制访问)使用|format=需要含有|url= (帮助). 1978-03, 51 (2): 90–98. Smith, Charles and Charles Harrington. Arithmetic for Schools. Macmillan. 1895. Sohrab, Houshang. Basic Real Analysis. Birkhäuser. 2003. ISBN 978-0-8176-4211-2. Stewart, Ian. The Foundations of Mathematics. Oxford UP. 1977. ISBN 978-0-19-853165-4. Stewart, James. Calculus: Early transcendentals 4e. Brooks/Cole. 1999. ISBN 978-0-534-36298-0. D.O. Tall and R.L.E. Schwarzenberger. Conflicts in the Learning of Real Numbers and Limits (PDF). Mathematics Teaching. 1978, 82: 44–49. Tall, David. Conflicts and Catastrophes in the Learning of Mathematics (PDF). Mathematical Education for Teaching. 1976-07, 2 (4): 2–18. Tall, David. Cognitive Development In Advanced Mathematics Using Technology (PDF). Mathematics Education Research Journal. 2000, 12 (3): 210–230. Wallace, David Foster. Everything and more: a compact history of infinity. Norton. 2003. ISBN 978-0-393-00338-3. Burkov, S. E. One-dimensional model of the quasicrystalline alloy. Journal of Statistical Physics. 1987, 47 (3/4): 409. doi:10.1007/BF01007518. Burn, Bob. 81.15 A Case of Conflict. The Mathematical Gazette. 1997-03, 81 (490): 109–112. JSTOR 3618786. doi:10.2307/3618786. Calvert, J. B.; Tuttle, E. R.; Martin, Michael S.; Warren, Peter. The Age of Newton: An Intensive Interdisciplinary Course. The History Teacher. 1981-02, 14 (2): 167–190. JSTOR 493261. doi:10.2307/493261. Choi, Younggi; Do, Jonghoon. Equality Involved in 0.999... and (-8)⅓. For the Learning of Mathematics. 2005-11, 25 (3): 13–15, 36. JSTOR 40248503. Choong, K. Y.; Daykin, D. E.; Rathbone, C. R. Rational Approximations to π. Mathematics of Computation. 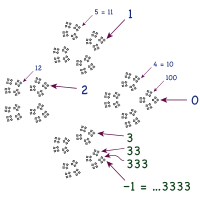 1971-04, 25 (114): 387–392. JSTOR 2004936. doi:10.2307/2004936. Edwards, B. An undergraduate student's understanding and use of mathematical definitions in real analysis. (编) Dossey, J., Swafford, J.O., Parmentier, M., Dossey, A.E. Proceedings of the 19th Annual Meeting of the North American Chapter of the International Group for the Psychology of Mathematics Education 1. Columbus, OH: ERIC Clearinghouse for Science, Mathematics and Environmental Education. 1997: 17–22. Eisenmann, Petr. Why is it not true that 0.999... < 1? (PDF). The Teaching of Mathematics. 2008, 11 (1): 35–40 [2011-07-07]. Ely, Robert. Nonstandard student conceptions about infinitesimals. Journal for Research in Mathematics Education. 2010, 41 (2): 117–146. This article is a field study involving a student who developed a Leibnizian-style theory of infinitesimals to help her understand calculus, and in particular to account for 0.999... falling short of 1 by an infinitesimal 0.000...1. Ferrini-Mundy, J.; Graham, K. Kaput, J.; Dubinsky, E., 编. Research issues in undergraduate mathematics learning 33: 31–45. 1994. Lewittes, Joseph. Midy's Theorem for Periodic Decimals. 2006. arXiv:math.NT/0605182 [math.NT]. Katz, Karin Usadi; Katz, Mikhail G. Zooming in on infinitesimal 1 − .9.. in a post-triumvirate era. Educational Studies in Mathematics. 2010, 74 (3): 259. arXiv:1003.1501. doi:10.1007/s10649-010-9239-4. Gardiner, Tony. Infinite processes in elementary mathematics: How much should we tell the children?. The Mathematical Gazette. 1985-06, 69 (448): 77–87. JSTOR 3616921. doi:10.2307/3616921. Monaghan, John. Real Mathematics: One Aspect of the Future of A-Level. The Mathematical Gazette. 1988-12, 72 (462): 276–281. JSTOR 3619940. doi:10.2307/3619940. Navarro, Maria Angeles; Carreras, Pedro Pérez. A Socratic methodological proposal for the study of the equality 0.999...=1 (PDF). The Teaching of Mathematics. 2010, 13 (1): 17–34 [2011-07-04]. Przenioslo, Malgorzata. Images of the limit of function formed in the course of mathematical studies at the university. Educational Studies in Mathematics. 2004-03, 55 (1–3): 103–132. doi:10.1023/B:EDUC.0000017667.70982.05. Sandefur, James T. Using Self-Similarity to Find Length, Area, and Dimension. The American Mathematical Monthly. 1996-02, 103 (2): 107–120. JSTOR 2975103. doi:10.2307/2975103. Sierpińska, Anna. Humanities students and epistemological obstacles related to limits. Educational Studies in Mathematics. 1987-11, 18 (4): 371–396. JSTOR 3482354. doi:10.1007/BF00240986. Szydlik, Jennifer Earles. Mathematical Beliefs and Conceptual Understanding of the Limit of a Function. Journal for Research in Mathematics Education. 2000-05, 31 (3): 258–276. JSTOR 749807. doi:10.2307/749807. Tall, David O. Dynamic mathematics and the blending of knowledge structures in the calculus. ZDM Mathematics Education. 2009, 41 (4): 481–492. doi:10.1007/s11858-009-0192-6. Tall, David O. Intuitions of infinity. Mathematics in School. 1981-05, 10 (3): 30–33. JSTOR 30214290.